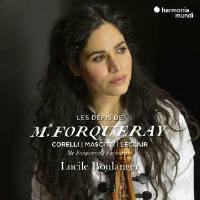 This seductive recording by French viola dagambist Lucile Boulanger and her talented trio of continuo players brings to light the virtuosic, experimental and often melancholy sound world of the great French Baroque viol player Antoine Forqueray. Boulanger traces the influence of the lyrical, exuberant Italian violin style on the French vernacular, dishing up a feast of arrangements and free transcriptions of violin sonatas by Corelli (whose Op. 5 had taken France by storm), by Michele Mascitti (a Neapolitan composer based in Paris), and by Forqueray’s col league Jean-Marie Leclair, whose works fuse Italian verve with French grace. Boulanger’s aim is to ‘unshackle’ her instrument – a goal she certainly achieves in these persuasive transcriptions, and in her delightfully unfettered playing she emerges as something of a Jacqueline du Pré of the viol. Forqueray’s own music drives the gamba to explore new effects and sonorities as it scales the heights and plumbs the depths of the instrument. Boulanger responds to his musical chiaroscuro, illuminating the autumnal colours of the viol’s lower reaches with streams of melodious light. The continuo’s palette is varied, too, from the thickly-layered textures created by a combination of harpsichord, bass viol and theorbo to the bright and transparent sound of the key board alone. The players are equally receptive to the expressive contrasts of Forqueray’s bilingual idiom: here, fiery and virtuosic, inflamed by the Italian ‘fantastic style’, elsewhere, languid and balletic, reflecting courtly French tastes. 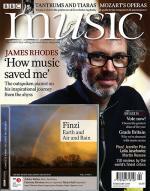 My only quibble is that Harmonia Mundi’s open recording in a resonant chapel acoustic lacks a little warmth.